The arrival of Muggletonianism in 1651 heralded a storm of polemical outpourings. As time passed these public disputations faded from the historic record and the movement gradually disappeared from sight. 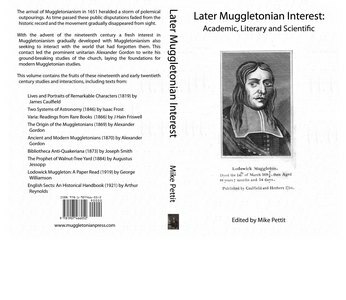 With the advent of the nineteenth century a fresh interest in Muggletonianism gradually developed with Muggletonianism also seeking to interact with the world that had forgotten them. 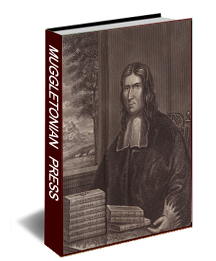 This contact led the prominent unitarian Alexander Gordon to write his ground-breaking studies of the church, laying the foundations for modern Muggletonian studies. This volume contains the fruits of these nineteenth and early twentieth century studies and interactions, including texts from: Lives and Portraits of Remarkable Characters (1819) by James Caulfield Two Systems of Astronomy (1846) by Isaac Frost Varia: Readings from Rare Books (1866) by J Hain Friswell The Origin of the Muggletonians (1869) by Alexander Gordon Ancient and Modern Muggletonians (1870) by Alexander Gordon Bibliotheca Anti-Quakeriana (1873) by Joseph Smith The Prophet of Walnut-Tree Yard (1884) by Augustus Jessopp Lodowick Muggleton: A Paper Read (1919) by George Williamson English Sects: An Historical Handbook (1921) by Arthur Reynolds.